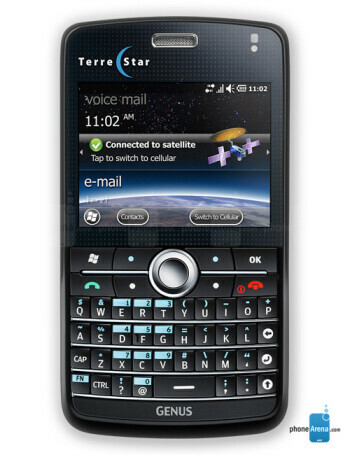 The TerreStar GENUS is advertised as the world’s first smartphone that combines 3G cellular wireless connectivity with an all-IP satellite network on one device using one phone number. The phone relies on AT&T's GSM/HSPA network while reverting to a satellite connection when AT&T's presence is missing or lost. The phone is running Windows Mobile 6.5.3 OS and features a QVGA touch display, QWERTY keyboard, 2MP camera, Wi-Fi, GPS and microSD slot for memory.